Tagline: Play what isn’t ready, walk away with a recording of the performance. The Experiment is a night dedicated entirely to musical projects that aren't ready. Anyone can come and play a few bars of a new guitar riff, or play a verse that one can't think of a chorus for or finished material that's just still a little wobbly. The whole night will be recorded and available for web download the following day. Musicians can listen back and dissect their performance into tiny little pieces if they want to. Local song writers Emi Jarvi and J Carmichael came up with such an original idea. At the Experiment, musicians can even discuss with the crowd about the composition process, in a safe place where new and raw ideas come to be born. This is really a place where one can get honest feedback from talented ears that will really listen. The first Experiment was on 18th of July. There was an excellent turnout. The vibes in the room were outstanding. The crowd arrived laid back with open minds and extra patience. The Experimenting included - Emi Jarvi and J Carmichael playing a set full of live loops, Ewan Fisher and Jan Minx playing spacious guitar driven freedom, and Gaz Percival, a true example of what can be accomplished by one man and his computer. The event will become regular, always on a Wednesday. WL: Where did the idea of the Experiment come from? Emi Jarvi: J and I had been putting a lot of work into a new live set that we're putting together and it wasn't quite ready, it still had some kinks to iron out. We were really keen to try and perform our new material somewhere, but didn't really have anywhere acceptable. A headline slot would be too much pressure and we wouldn't do the crowd justice. An open-mic wouldn’t work because there's no set up time. Also there seems to be an unspoken rule of acoustic instruments and no extra bells or whistles (pedals, computers, vocal harmonisers, etc... there just isn't time). I'd been racking my brains trying to think of an acceptable place to debut a new project that isn't really shiny and ready for release. 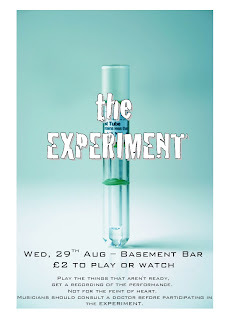 Then I thought of the EXPERIMENT at City Screen Basement Bar. WL: Do you mind attracting ambitious but less talented players? Emi Jarvi: I strongly encourage ambitious but 'less talented' players!!! This is a night that celebrates anyone who pours themselves into music. But I also ask the performers to be prepared for constructive suggestions and ideas regarding their stuff. I know how hard it is to listen to criticism about the things you've created, but it's an essential part of becoming better. If you're truly new to song-writing or performing, and your material will perhaps be 'more raw' than the rest, feel free to request that everyone keeps their mouth shut about it. Tell the crowd how new it all is to you, we'll understand! Also, there will be 'planted ears' in the crowd (a few people that I know and trust who are talented and educated about music) who are guaranteed to give your set their full attention and will be available to talk to you if you'd prefer 1 to 1 feedback. Also, if you don't want their set uploaded to the web, you just need to let me know and that's cool too. Emi also said that the Experiment is not a place to get up on stage and bash out drunken slurred versions of Oasis covers, for instance. It's not a place to turn up and heckle musicians who have the courage to get up on stage. No one should be there to make the performing uncomfortable. Drunkards and mean mouths will be asked to leave.